Honeywell boiler and burner related products are among the most effective and efficient available today, and at ATI, we are uniquely positioned to connect you with the Honeywell product that best fits your commercial/industrial application. Honeywell manufactures an extensive line of boiler/burner control products for all manner of commercial HVAC applications, including heating, cooling, humidifying, and indoor air filtration. Utilizing advanced software programs and optimally designed sensors, switches, gauges, and other control instruments, Honeywell creates improved indoor comfort, energy savings, maximized safety, and environmental responsibility. 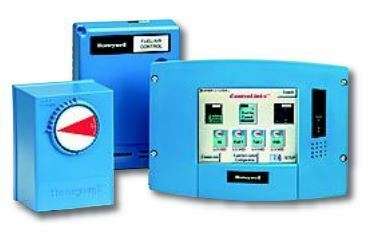 The Honeywell boiler and burner auxiliary product line includes flame safeguard controls, modulating air-fuel ratio controls, burner/combustion controls, firing-rate motors/linkages, flame detectors/monitoring systems, gas valves, ignition transformers, temperature controls, pilot burners, programmable zone controllers, variable frequency drives, energy meters/sub-meters, valve/damper actuators, switches, timers, sensors, thermostats, radiant heat controls, and more. To learn more about the specifics of Honeywell's highly diverse product line, you can visit their website and click on the product of interest under the Product tab. Besides individual components, Honeywell also manufactures complete boiler/burner management systems, most notably their Control Links System. Control Links offers many unique, beneficial features, including: unique air/fuel curves, separate light-off points, separate minimum/maximum modulation points, and a universal, parallel-position actuator that gives you 100 pounds of torque to control dampers/valves, helping to optimize burner performance. Special safety features include: a potentio-meter circuit, component anti-swap protection, and curve verification algorithms. Honeywell Slate is much like Control Links in its basic concept, only more powerful and with many additional features. 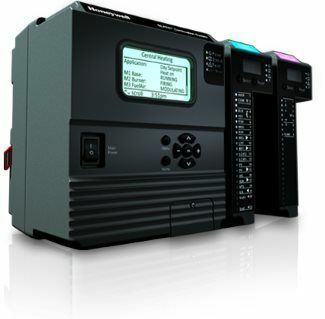 It is highly innovative in that it gives you full programming/configuration options in a single, modular platform. At ATI of New York, we connect you with only the very best commercial/industrial equipment on the market and help you to select the product(s) that optimally meet the needs of your specific application. To schedule a free consultation with ATI agents, simply fill out the request form that appears on the current page.